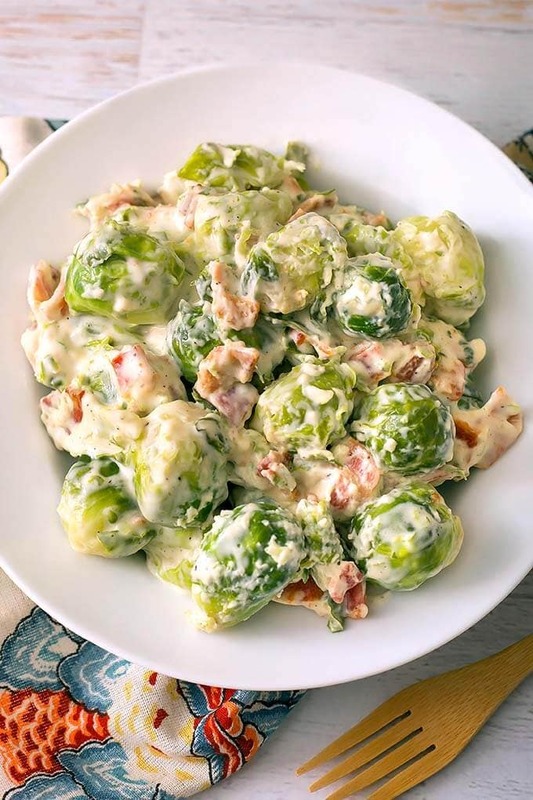 Instant Pot Creamy Bacon Brussels Sprouts are so delicious you might end up converting someone who doesn’t like Brussels Sprouts! These are savory, creamy, and just the perfect texture. 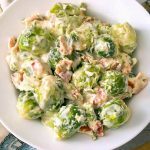 Pressure Cooker Creamy Bacon Brussels Sprouts are a perfect side dish for Thanksgiving, or any Holiday. 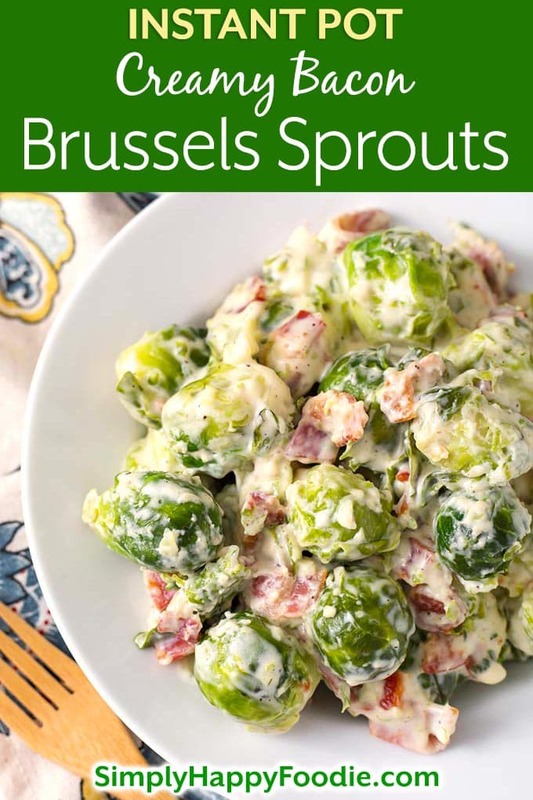 You really don’t need to wait for a special occasion, you can make these Instant Pot brussels sprouts any time! When Thanksgiving rolls around I am on the lookout for a few great side dishes to make for the meal. I like Green Bean Casserole, but we’ve had it so many times that something different sounded good to me. I decided to play around with Brussels Sprouts. Paul does not like them at all, so I was my own taste tester for this one! 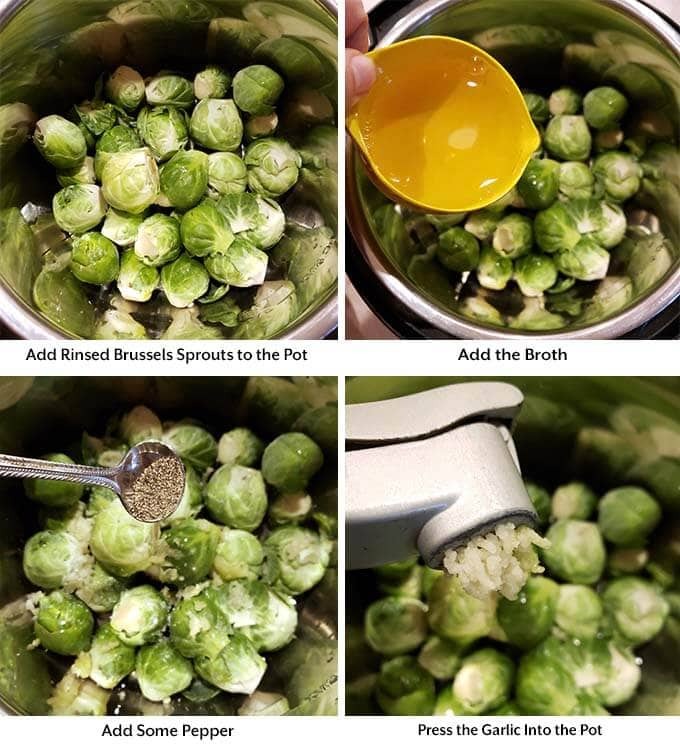 Making Brussels sprouts in the Instant Pot® is the way to go, in my opinion. They come out perfectly cooked. Not mushy at all using this method. Look for my other Instant Pot Brussels Sprouts recipe coming soon! I’ll link to it here when it’s ready. In the past I have made Brussels sprouts with a lot of cheese, and they came out very good, but a little heavy to go alongside a large Thanksgiving feast. For this recipe I backed off of the cheese and made them creamy, with lots of bacon. I’m very happy with the results! You probably wont need to add any additional salt to this recipe as the bacon has plenty. My first batch had 1/4 tsp of coarse salt, and that was too much for me. It might depend on the type of bacon you use. Also make sure you use low sodium chicken broth and unsalted butter for the best results. If you find it needs a little salt, add it at the end. 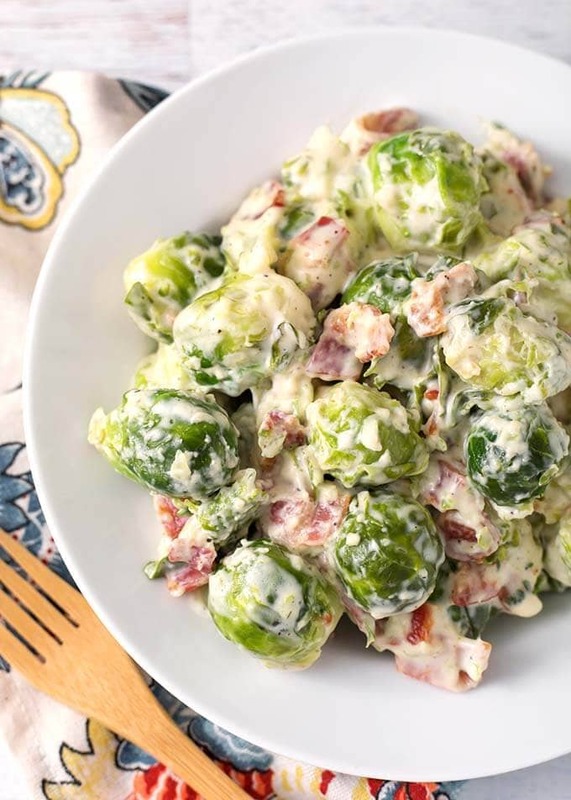 Instant Pot Creamy Bacon Brussels Sprouts are so delicious you might end up converting someone who doesn't like Brussels Sprouts! These are savory, creamy, and just the perfect texture. Trim the ends of the Brussels sprouts and rinse them in hot water. Then add them to the inner liner pot of the pressure cooker. Add the chicken broth, garlic, butter, pepper, and cream cheese. Press the Pressure Cook/Manual button or dial, then the +/- button to select 2 minutes (3 minutes for a softer result). The pot will take a few minutes to come to pressure. When the cooking cycle has finished, Turn the steam release knob to the Venting position to do a Quick Release of the steam/pressure. 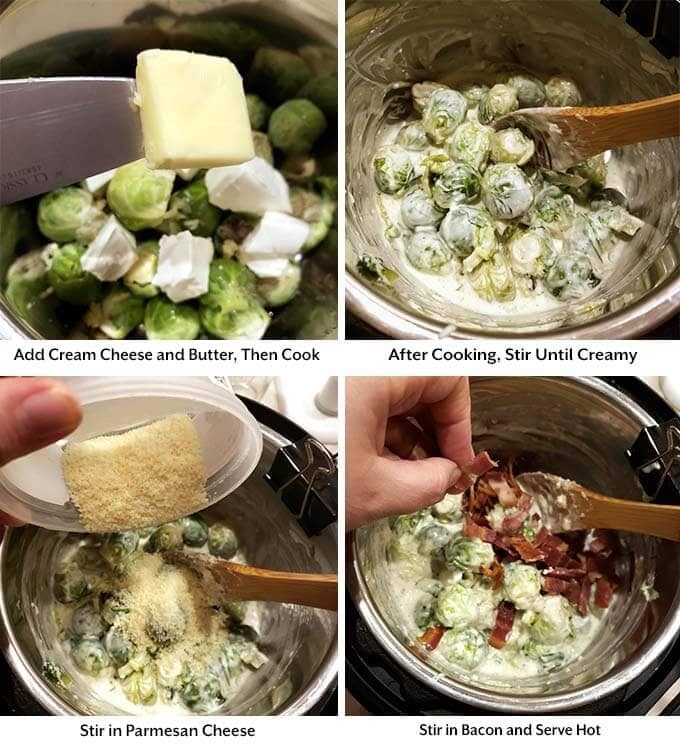 When the pin in the lid drops down, open the lid and stir the Brussels sprouts until the cream cheese is smooth. Add the parmesan and stir well. Add the bacon and mix it in. 1. Don't double the broth, just increase by 1/4 cup. Then, after cooking, you can add a little if it is too thick. 1. Keep cook time the same. This sounds delicious. I can’t wait to try it. Can this be mde with frozen sprouts? I think so since you don’t have to sauté them. I made this tonight for a work pot luck. I doubled the recipe and left out the bacon. I ended up draining about 1/2 c of the broth after it was done but they turned out so good. Can’t wait to eat these tomorrow! Hi, I’m glad you liked it. I don’t double the liquid when I double the recipe, just increase it by about 1/4 cup. Thank you for the review! We really enjoyed this recipe. The bacon was a nice addition and made it have lots of flavor!! I had never had brussel sprouts with a creamy cheese before. Very good! Hi Carol, Triple everything except the broth. Increase by 1/2 cup. When done cooking, add a little more if needed. And cooking time will stay the same correct? Are all your recipes for the 6 qt. size? I can’t figure that out. Would I just halve them for a 3 qt.?? The norm is to develop recipes for the 6 qt size as that was the original size produced. I do have some recipes that are specific to the 3 qt, and they are labeled as such. Most of my recipes can be cut in half, and in most cases you will keep th ecook time the same.